So Good, You'll Never Believe It's Protein! 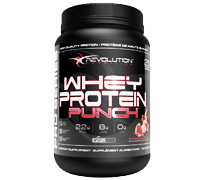 Whey Protein Punch™ is the latest innovation from Revolution Nutrition™! Using the unique Flavor Match system, Whey Protein Punch™ is a breakthrough protein supplement that tastes and feels just like your favorite fruit juice! Unlike most protein supplements on the market, Whey Protein Punch™ offers a high quality protein source without having any milky texture. You can now enjoy a light, refreshing and fruity protein supplement! Whey Protein Punch™ contains 22 grams of high quality protein per scoop and absolutely no fat! Protein needs depend greatly on your body type, gender, weight and the level of activity you maintain. Mix 1 scoop of Whey Protein Punch™ with 200-250 ml of water or your favorite fruit juice. Simply blend with a spoon or use a shaker bottle.